← Please let us come back to our senses! It is almost impossible not to see that the approach that we as a society have taken to economic development, to the way the economy is shaped, hasn’t worked for many people and is devastating the planet. Or more to the point, what is the economy for and how does it need to function in order to serve people and planet? Of course, it is not possible to answer these questions in a short blog; nor do I have the answers. I’m not an economist (which, given the current state of the world may be a relevant qualification to attempting answers to the questions) and I couldn’t possible try to even map out a comprehensive answer. But it is essential that these questions are answered; it is essential that ordinary people try to contribute to the answers; and we won’t get any sensible answers if we leave it to economists who are bought into the model that doesn’t work. So here are some basic questions. Does money grow on trees? Well, no, it doesn’t. But it might as well. Because it is basically created out of thin air by banks. Most of the money in circulation is in the form of credit (or debt). These two things are broadly the same thing unless you have cash your pocket. And even that is, in a way, credit/debt because you can only use it to exchange it for goods and services. One of the fundamental problems with our economy is this: we have forgotten that money is a means of exchange and it is based on trust between people and organisations. It is not a commodity that has any actual use value: you can’t eat it, you can’t drink it, you can’t heat your house with it (well, not very efficiently, anyway). But because we think of it as a commodity, people hoard it and feel they need more and more and more of it. And that drives greed. And that drives inequality. dels) were created by people. It’s a bit like anything else designed by people: there are alternatives and over time things tend to be changed (and often the reason to change is to improve things, although it doesn’t always work that way). The same is true for the free market economy. Classic free market theory is based on a lot of assumptions. 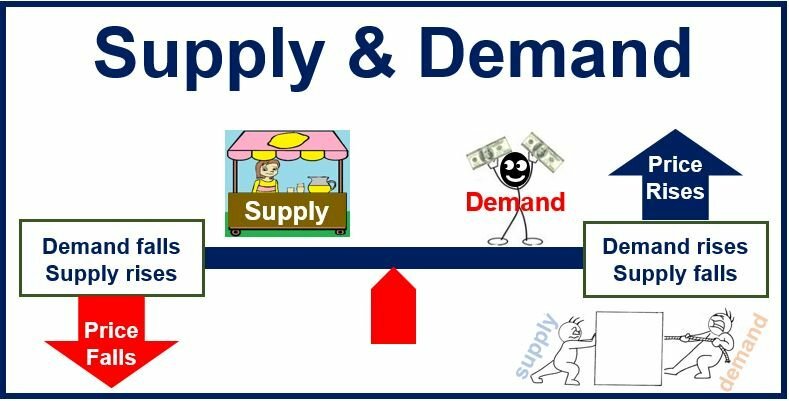 When I took some Economics classes at university (albeit a few decades ago), the first thing we were presented with was the law of supply and demand. The lecturer said (I kid you not): the theory of supply and demand, which governs price is based on the assumption that all buyers and all sellers have perfect knowledge of the market. Well, it doesn’t take a brainbox to debunk that one. So you want to buy a broadband and phone package. Have a look on the Internet and look at the options. There are so many, and they are so not comparable, perfect knowledge is a pipedream. That’s just one example. If this assumption is false, doesn’t it follow that the theory sits on hollow feet? And should we therefore change the assumption to one that stands up to scrutiny in the real world? And formulate an economic theory that therefore more closely resembles the lives we live? Do we value the contribution of different factors of production correctly? What do we mean by different factors of production: land, capital, resources, and labour. It is that simple. Although some argue that the fourth factor isn’t resources but entrepreneurship. I’d argue about that because that is only one specific form of labour which is put into a separate category to ensure it gets valued differently. And don’t let them tell you it is different because it involves risk taking. Tell a coal miner or someone working as a fisherman in the high seas that they don’t take risk. But they’re not considered entrepreneurs. Rather, the person sitting behind a desk getting them to do these things is the entrepreneur! It strikes me that there are very different rules that apply to the value of any given unit or type of any one of these four factors. One of the important issues is: how much of one of them does someone control and does that give them more control than others who have less? Of course, all this is very complicated once you get into detail. But in essence, and because labour comes packaged as individual people offering a strictly limited amount of labour each, they can be controlled by other factors (or by the people who own the other factors) unless they band together to fight a joint corner. And what has happened to Trade Unions in the last 40 years? I leave that one for you to work out. The most mobile of these resources is capital, especially in the form of money (remember: that is debt/credit). You can take it anywhere and so you can dictate to those who have less mobile factors at their disposal the price at which you’re willing to pay for theirs. That introduces an imbalance. And often people who have capital have it because they inherited it or because they were very lucky or because – for one reason or another – they have got themselves into a position where they are paid way more than others. So why do some people get paid more than others? You could imagine (just for arguments sake) that each unit of labour – irrespective of what you do and what the outcome of that unit of labour is – is valued at the same level. Imagine: someone who cares for people in a care home gets paid the same amount per hour as someone who designs complicated financial products in a bank. 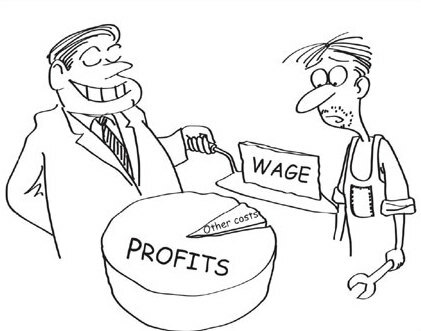 Or someone who cleans a school or cooks the school dinners gets paid the same amount per hour as the person running the school. I know, you’ll say that’s idiotic, not fair, doesn’t provide an incentive to ‘better yourself’ etc., etc. So how should we value labour? What is the rate for the job? People will argue that factors such as education, training, responsibility, the complexity of the job should all factor into this. But what about looking at how important for society a given job is as a determining factor for pay? So, is a nurse more important than an investment banker? Is a teacher more important than a racing driver? Is the person who keeps public toilets clean more important than a footballer? Is the tax collector more important than a pop star? Just asking! Where does any this leave us? Think about it. It would mean changing everything. It would mean thinking completely differently. But we can do it. And if you put it that way, doesn’t it make sense? This entry was posted in Economics, Equality, Politics in context and tagged business, economics, factors of production, Markets, money, politics, supply and demand, Trade. Bookmark the permalink.